Please accept my humble obeisance in the dust of your lotus feet. Here at the Devotee Youth Festival in South Africa, the devotees are glorifying your Divine Grace today. It is not your Vyasa Puja. It is not your disappearance day. It's just an ordinary day, so to speak. "One should always remember and praise the spiritual master. At least three times a day [sunrise, noon, and sunset] one should offer respects unto the lotus feet of the spiritual master." Of all the topics I speak about, my favorites are your name, form, charac-teristics, and pastimes. I am always remembering you within my heart, speaking about you with my friends, glorifying you in the assembly of devotees, and taking great pleasure in spreading your glories among the fallen and downtrodden souls within this material world. This is only natural because you are the most important person in my life. You were, in fact, the first devotee I was introduced to. On a warm summer evening in Ann Arbor, Michigan, just over forty years ago, I chanced upon a group of sannyasis chanting the holy names on the lawn of a university. I came forward to listen to their singing, intrigued by their dress, their demeanor, and their obvious joy. 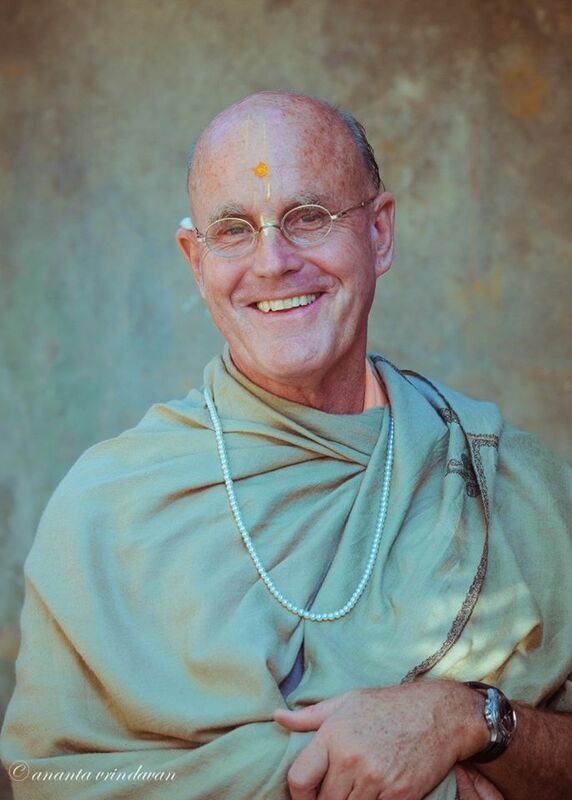 The leader, Visnujana Swami, stopped the kirtan and called me over. "Sit down, young man," he said, "and I will tell you about the glories of my spiritual master." As he spoke about your personality, teachings, and mission, I found myself slowly accepting you into my heart as my own spiritual teacher. When Maharaja finished, I had a question. "Can I become his student too?" I asked. "Yes, of course," Maharaja said. "You must. He's Prabhupada, the master at whose feet all other masters sit." "Of all the topics I speak about, my favorites are your name,form, characteristics,and pastimes." That very evening, without hesitation, I decided to embrace all your instructions and thus began watering the seed that Maharaja had planted in my heart. And day by day thereafter, my faith in you increased along with the faith that you could take me home to the spiritual world, where every word is a song and every step is a dance and there is a constant festival of mirth and joy. Wanting to surrender fully, I gave the years of my youth in service to you, that period of life when a strong body, powerful senses, and a fruitive mind convince us that there are great opportunities for sense enjoyment. But it was not hard to give those precious years to you, Srila Prabhu-pada, because service to you was, and will always be, the greatest happiness in my life. In fact, I passed through youth and then middle age without even noticing it because I felt satisfied in the service of book distribution, harinama, and festivals. When we hate our work, time passes slowly, but when we love it, time seems to fly. And so it is that I now find myself in the final stage of life—jara (old age)— described by the Bhagavad-gita as one of the four fundamental miseries of the material world. I am beginning to feel the pains that old age inflicts upon us all, but as always, my service to you brings such satisfaction and joy to my heart that I am reminded of Arjuna on the battlefield of Kuruksetra. Absorbed in his service to Sri Krsna, Arjuna felt the arrows of the Karauvas upon his body to be nothing more than thousands of fragrant flowers. My godbrothers, godsisters, and I have been so fortunate to experience your blessings in our lifetimes. May we now ask something else of you? It is said that children are the future of any society, so may we ask you to also shower your blessings upon the young people of our movement? Soon our children will inherit the responsibility that you entrusted to your direct disciples: the responsibility of preserving and spreading your mission. Please bless them with victory. Please bless them with the same bliss we have felt in serving your divine command. Once in Vrindavana after a public program, you and your servant left by ricksha for the Krsna Balarama Mandir in the dark night. I started walking home with some godbrothers, but I lagged behind and soon found myself alone. Suddenly your ricksha appeared as if from nowhere. You stopped the ricksha. "What are you doing here?" you asked me. "I am lost, Srila Prabhupada," I said. You smiled. "Then follow me home," you said. So I ran behind your ricksha the whole way back to Krsna Balarama Mandir. My dearest master, may I continue running behind you all the way back to the spiritual world, and there, in that transcendental abode, may I serve your every need and desire. May your work here in this world never go in vain. May countless souls experience the satisfaction of taking shelter of your lotus feet for ten thousand years to come.